As expected, since it’s the first week of the month, the Android distribution numbers have been updated. 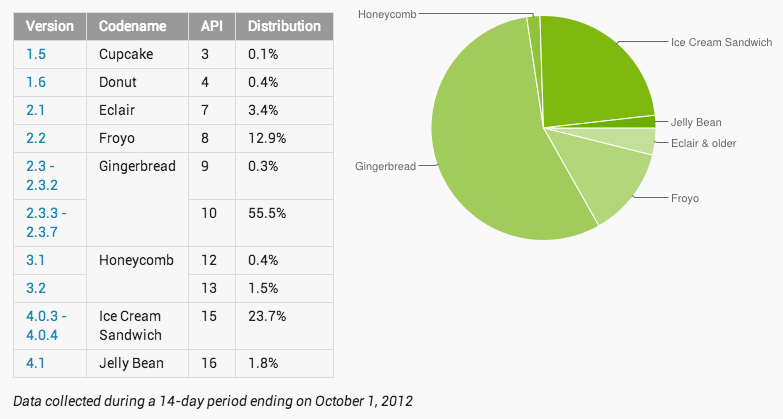 Also as expected, they look very similar to last month’s numbers, which show Gingerbread (Android 2.3) continuing to dominate and Ice Cream Sandwich (Android 4.0) slowly on the rise. Jelly Bean (Android 4.1) on the other hand, jumped a whopping 0.6%. This is life on Android, folks. If you want the most current version of Android, you buy a GSM Nexus phone. If you don’t want to leave Verizon for said GSM device, then you are forever going to be stuck in the 6-8 month long update cycle. Since Android OEMs do not control both hardware and software like Apple, it’s always going to be a struggle. Google creates the base of the software, OEMs tweak it to their liking, and then carriers sign off on it before letting it reach your device. It’s an impossible battle to win in a timely manner, until some miracle update process is discovered.